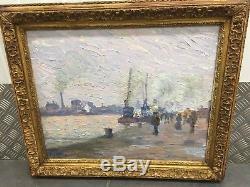 Description: pretty impressionist landscape painting by painter eugene tirvert of the school of'rouen; edges of Seine to Rouen with ferry boats datee 1903; nice bill with a thick paste and bright colors reflecting the industrial harbor atmosphere of the edges of Seine; original frame in gilded wood gold leaf origin. 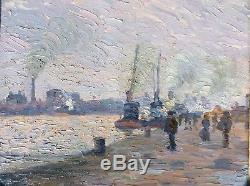 Sustained and ascending coast for this Rouen artist. Dimensions: oil / panel 40x60 cm. 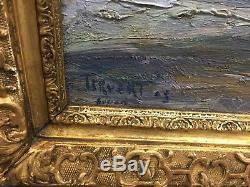 State: perfect origin; gilded wood frame gold leaf original in superb condition. 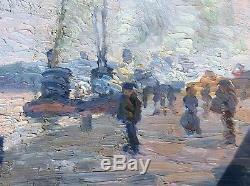 Good bidding and good discoveries for this beautiful impressionist painting. 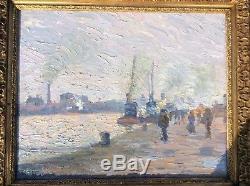 I remain at your disposal for any information or complementary photo: tel portable 06 78 50 23 10. International ebayers are welcome: nice eugene tirvert impressionism painting; edges of Seine in Rouen in 1903; oil on panel painting - signed and dated 1903 at the lower left. Posting to the world as possible: 30. 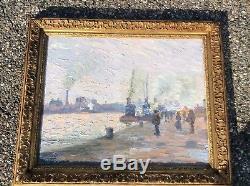 The item "eugène tirvert impressionist painting edges of Seine in Rouen hsp datee 1903" is for sale since Wednesday, October 24, 2018. 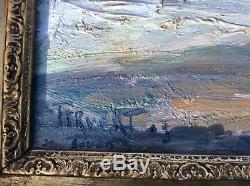 It is in the category "art, antiquities \ art of the xix and before \ paints, enamels ". 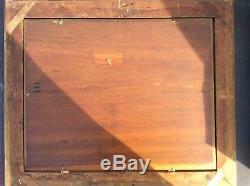 The seller is "gentleberty" and is located in / strasbourg, alsace. This item can be delivered anywhere in the world.